We get you ready for the start of spring practice for Tennessee’s football team with our position preview series. Up next is a look at the Vols’ quarterbacks. You can read our preview of the Vols’ running backs here. This time last year, Tennessee had just two scholarship quarterbacks on their roster. Now, the Vols have three healthy scholarship signal callers as they enter spring practices, and they bring back a full-time starter from last season. Jarrett Guarantano is entering his fourth year at UT, and he’s entering his first spring where it looks like he’s the undoubted starter at his position. Guarantano started all 12 games of the season for the Vols last year, and he showed some promise despite taking a beating and not always making the right decisions. Overall, though, he showed enough skills for Tennessee’s coaching staff to keep him in as the starter and for them to not heavily pursue a grad transfer or regular transfer option this offseason. This spring will mostly be about the development of Guarantano and seeing how much more progress he’s made since the 2018 season ended. With Jim Chaney as Tennessee’s new offensive coordinator and Chris Weinke moving over to teach quarterbacks, Guarantano has more change to adjust to. And if there’s one thing he’s gotten used to at UT, it’s change. Chaney will be Guarantano’s fourth different offensive coordinator in his four years at Tennessee, and Weinke will be his fourth different quarterbacks coach as well. Luckily for Guarantano, Chaney’s offenses in the past have been known to be friendly to quarterbacks, and Weinke is a former Heisman winner himself as a QB for Florida State back in the 1990s. If ever there was a year where Guarantano would take a big step forward, it’s likely to be this one. Of course, his offensive line will have to help him out more. But Guarantano himself has plenty to work on and improve upon himself, and this spring is the starting point for all that. But Guarantano isn’t the only QB on the Vols’ roster this spring, and he isn’t guaranteed the starting position if one of Tennessee’s other quarterbacks has a breakout set of practices, either. JT Shrout redshirted last year as a freshman, and he’ll look to try and make a move and supplant Guarantano if possible. Shrout has a big arm, but he was somewhat erratic in high school. Chaney and Weinke’s influence on him will be very interesting to see. The newcomer to the quarterback room is Brian Maurer. He joins the Vols as an early enrollee in the 2019 signing class, and the three-star QB will look to make some waves in his first spring with Tennessee. In all likelihood, Maurer is destined for a redshirt season himself in 2019, but he’s already getting positive reviews from his brief two months on campus. If he turns heads and surprises this spring, who knows what might happen? 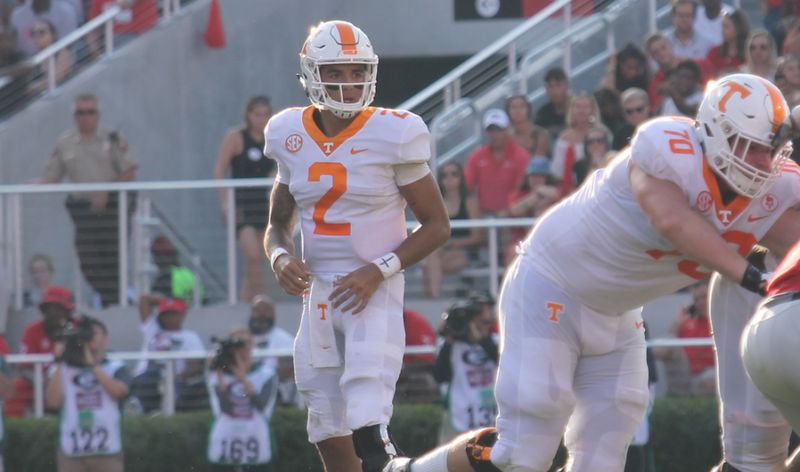 As intriguing as it will be to see the growth of Shrout and witness Maurer’s potential, the main focus at quarterback this spring is the development of Guarantano. Unless he gets hurt, the rising redshirt junior is Tennessee’s likely starter again this upcoming season. Unlike the last couple springs, there won’t be a full-blown quarterback competition for Tennessee. Both Shrout and Maurer will definitely compete with Guarantano, but it’s highly unlikely he gets unseated this spring. Instead, he and UTs offensive roster will start to adjust to Jim Chaney’s offense and begin to get their feet wet in their new offensive system.